Me serving for a bit. Any feedback? Balance would be the big this I would work on. That is, moveing forward with better rotation to land with better balance (your leg is kicked out sideways and you are bent most the time). Something like this (not a fan of the guy but this demonstrates the basic idea). The ceiling is so low. Can't hit moon balls. 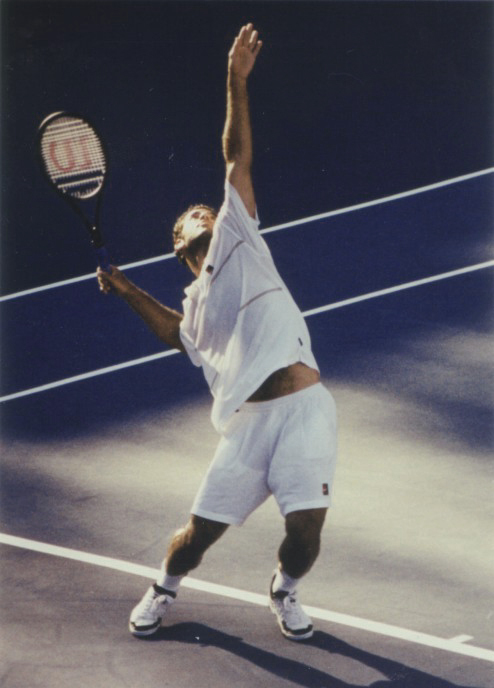 Too much motion blur to see the faster parts of your racket motion. If weather allows repeat outdoors in direct sunlight. Serve toss is pretty erratic. This is the foundation of your serve and needs to be more consistent. Oh wow I never really thought about this, thanks!! I get the idea of moving forward and my left leg landing inside the line, but what’s the practicality of swinging my right leg back? Your toss is horrendous and needs work. In addition to what @IowaGuy said, you also need more shoulder coil back. I recall you saying that you want to play college tennis. If that’s correct, get a good coach to help you with your serve. Bh slice needs work. Fh is too slappy. Movement and feet need to be lighter and quicker. Bro, do you even topspin?